The machines that Harrison Ford was hunting down in Blade Runner were definitively dangerous, androids to be destroyed. But the confidence with which the engineers within the Additive Repair Development Center (ARDC, located inside the Polytechnic University of Bari and in partnership with the Polytechnic) handle the Laser Deposition machines, can imaginatively conjure up the image of an engineer 4.0 who programs and commands laser machines on how to rebuild and repair metal parts according to his or her design. Even more so if the machines in question work on the turbine blades of an aircraft engine. "Machines are essentially stupid...they think they are executing commands with absolute precision, but they need human direction to do the job accurately. They are excellent arms, with quite advanced brains, but never like a human one." Gianluca Maggipinto is one of the researchers at the Polytechnic University of Bari and is part of Giulio Longo's team, the Test Engineer Leader at ARDC, which comprises five other young engineers: Cesare, Marco, Nicola, Paolo and Vincenzo. Recently, the Avio Aero laboratory in Bari made Cold Spray available to airlines, the first additive repair technique developed for certain aircraft engine components. Laser Deposition is the second technique available in the Bari laboratory, and it’s currently under development. 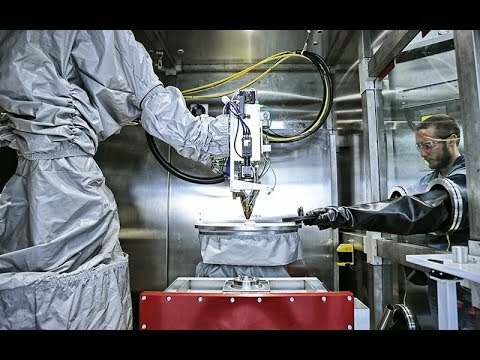 According to this technology, metallic powder is deposited on the engine part to be repaired, or on the portion to be rebuilt, using a high-precision laser. Laser deposition is suitable for very thin engine components, small in size, difficult to weld or restore, such as stator or rotor blades. The Laser Deposition machine, overseen by Gianluca and other engineers, is mainly composed of a large robotic arm at the center of a chamber about three meters wide and three meters deep. The robot has a laser head that moves on a five-axis system; the laser is directed toward a bench on which the part to be repaired is positioned, and that slides on a carriage allowing it to exit or enter the chamber through front or rear doors. The laser processing, in fact, can only take place when the chamber has a protected atmosphere saturated with argon (an inert gas that eliminates oxygen and prevents oxidation during the process). "Introducing the argon and saturating the chamber is actually the longest operation in the process; the laser then deposits the molten metal on the part to be repaired, which can take 20 to 50 minutes. Next, the turbine blade, in this case, is worked to restore the original shape, removing the residue of the metal added to the first missing part." Using reverse engineering, Gianluca can detect a defect, or a small missing portion, on the component and view the component reproduced in 3D on his screen. This process that can be performed thanks to a laser scanner with a maximum error tolerance of 65micron, almost half the width of a hair. At that point, "I precisely position the part on the PC, because the computer software I use to program, operate and execute the deposition must be perfectly aligned with the positioning and with the actual dimension inside the machine. And then I start to work on the defect." The way the scanner works is stunning: in fact, it is a secondary laser in the machine that operates on the bench and captures a points’ cloud. Gianluca's computer software performs a triangulation using this myriad of points (i.e. positioning, size, thickness, surface, and depth data) and finally reproduces an object on-screen, to which Gianluca then applies actual measurements and controls in order to work on it in real terms. "Using a computer, I provide the laser with the sintering strategy as well as the commands: the machine would make inaccurate approximations, so an engineer is needed to indicate with mathematical and geometric certainty how to perform the metal deposition on the blades." The Laser Deposition technique development process, with a high probability, will follow that of Cold Spray: testing and certification by the authorities in order to become a new resource for the servicing and repair of aircraft engines. Fast and much more efficient. Furthermore, this laser technique is suitable for a wide range of metals or alloys, which, however, will have to undergo the necessary experimentation and development times. Among other alloys currently used in Bari, there is TiAl (titanium and aluminum alloy), which the low-pressure turbine blades of the new GE9X engine are made of: "this superalloy is highly complex, due to the material's adaptability and malleability properties. We are welding an alloy, something that was unthinkable 10 years ago!" Gianluca highlights the relevance of software that allows to work on the parts, "we have optimized it ourselves in the Lab," as well as the technical equipment used in Bari. "This level of equipment makes the difference in our work; we're lucky to be able to work in such a cutting-edge environment, especially when compared to the equipment that is generally available in universities." Gianluca's confidence with these machines reminds us of Harrison Ford in Blade Runner... luckily, there are no two-meter high androids to be destroyed... only turbine blades to be repaired.